While risk aversion continued in Asian session, volatility cooled mildly. Major pairs and crosses are staying in relatively tight range. Swiss Franc and Sterling are generally higher while commodity currencies are soft. But the picture for the day could easily change. For the week, dusts have little settled. Yen is trading as the strongest one on risk aversion. Euro, as second strongest, is supported by weakness in Dollar and Italy-EU budget deal. Australian Dollar is the weakest one, followed by Canadian and then New Zealand Dollar. Technically, USD/CHF breached 0.9848 key support but quickly recovered. USD/JPY is close to 110.75 key fibonacci level. Meanwhile, EUR/JPY took out 127.61 support quite firmly yesterday. GBP/JPY also break 141.17 support. More downside is now favored in both Yen crosses. We’ll see whether further decline in EUR/JPY and GBP/JPY would drag USD/JPY down. Or, selloff in EUR/JPY and GBP/JPY with rebound in USD/JPY and USD/CHF would drag down EUR/USD and GBP/USD. Risk aversion once again spread from US to Asian session. Nikkei closed down -1.11%, or 226.39 pts to 20166.19. That’s the lowest level since September 2017 and 20000 handle is now vulnerable. At the time of writing, China Shanghai SSE is down -1.11% at 2508. However, losses in Singapore Strait Times (-0.30%) and Hong Kong HSI (-0.03%) are relatively limited. Overnight, DOW lost -1.99% or -464.06pts to 22859.60. S&P 500% dropped -1.58% and NASDAQ dropped -1.63%. DOW is now pressing key support level at 38.2% retracement of 15450.56 to 26951.81 at 22558.33. There is prospect of some recovery before yearly close. But it has to overcome near term resistance at around 23500 before declaring bottoming. On important development to note is that acceleration in flattening of US yield curve. Overnight, 5-year yield closed up 0.026 to 2.653. 10-year yield rose 0.011 to 2.789. More importantly, 30-year yield breached 3% handle to 2.957, then closed at 3.012, down -0.003. Meanwhile, yield curve remains inverted between 2-year (2.675) and 3-year (2.652). Japan national CPI core slowed to 0.9% yoy in November, down from 1.0% yoy and missed expectation of 1.0% yoy. Germany will release Gfk consumer confidence in European session. UK will release Q3 GDP final, current account balance and public sector net following. Later in the day, Canada will release October GDP and retail sales. US will release Q3 GDP final, durable goods orders and PCE inflation. Some more volatility could be seen before weekly close. 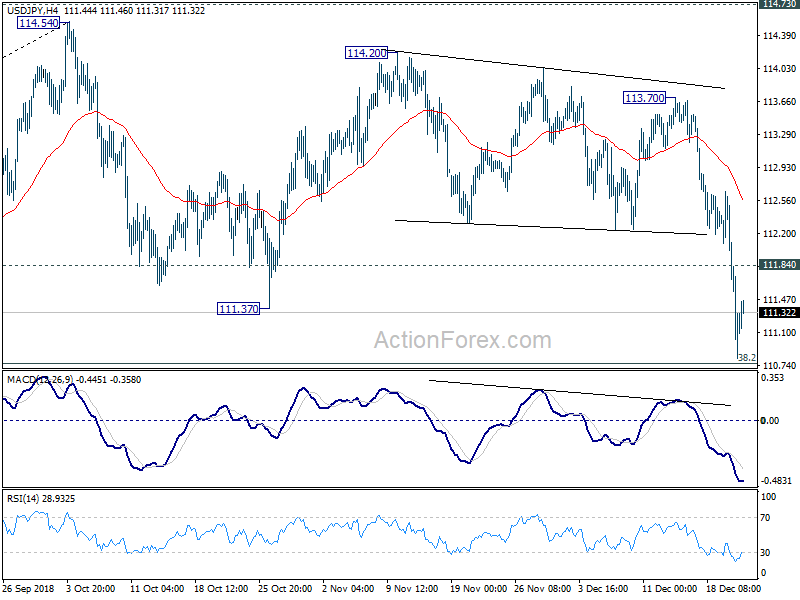 USD/JPY dropped to as low as 110.81 so far before recovery mildly. Outlooks is unchanged that price actions from 114.54 are viewed as a consolidation pattern. We’d continue to expect downside to be contained by 38.2% retracement of 104.62 to 114.54 at 110.75 to bring rebound. On the upside, break of 111.84 will turn bias back to the upside for rebound to 4 hour 55 EMA (now at 112.56). 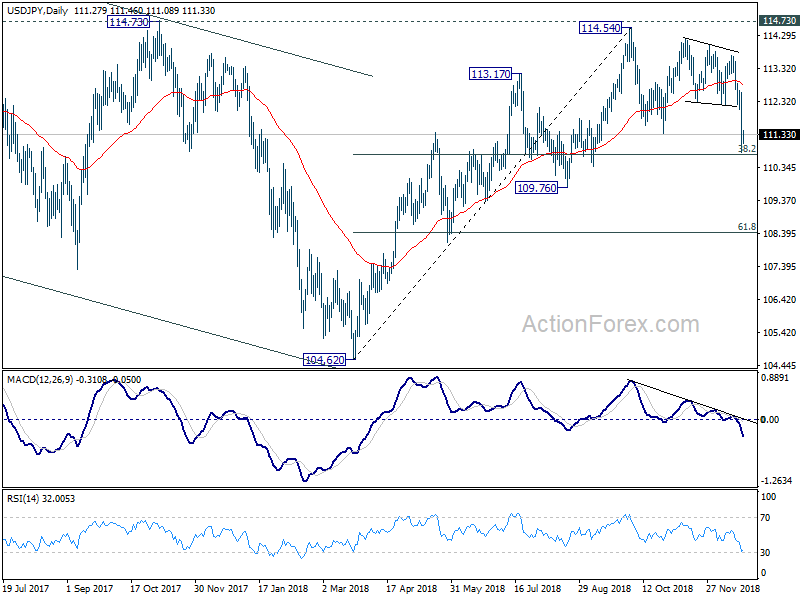 However, firm break of 110.75 will target 61.8% retracement at 108.40.